Back in the late 60s and early 70s, the "hippies" were warned that smoking marijuana or taking even one LSD "trip" would result in deformed offspring. It was widely publicized that even males could contribute to birth defects through their tainted sperm. These kind of institutionalized rumors had only brief success in reducing the youthful experimentation with psychedelic drugs. When an exposé of the facts was finally published, showing that these claims were made up, a backlash against any warning linking drugs taking to birth defects resulted in widespread consumption. As drug addiction became more widespread, drug treatment centers also had to handle an increased number of cases. While the recreational drugs may have caused some psychological problems among the youth, the real damage was being done by the pharmaceutical companies. Thalidomide was a medication pushed by obstetricians and sold to pregnant women in a number of countries across the world, beginning in 1957. In 1961 it was withdrawn from the market after being found to be a cause of birth defects in what has been called "one of the biggest medical tragedies of modern times." Thousands of children were born with deformed arms and other ailments. Things have only gotten worse since then. Despite the FDA and other agencies who have a mission to protect consumers from harmful drugs, pharmaceutical companies have been able to churn out hundreds of chemicals only to have them recalled when side effects, sometimes lethal, appear in the population. In some cases these ill effects were known and hidden from the research submitted for approval. Stiff fines in the millions of dollars are levied by the government, yet the pharmaceutical companies, who make billions, see this as just the price of doing "business as usual." Recently, consumers have complained that many of today's illnesses, such as ADD, bi-polar depression and even erectile dysfunction are being hyped to increase pharmaceutical profits. These new "diseases" seek to keep patients on a regular daily regeme. Often the medication required for the ailment has side effects that require additional drugs to mediate the symptoms. A case in point are drugs such as SRE's, such as Zoloft, used to treat depression, which causes erectile problems. Patients often end up taking something like Viagra. Now, in television ads, people are being told that SRE drugs may not solve depression and that additional medication will make the patient not only free from being sad, but "happier." Where has all this medication taken us? Not surprisingly we're back to the birth defects. 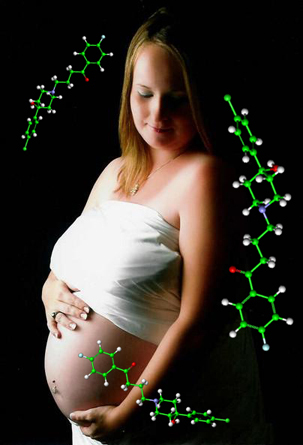 A new study published by ScienceDaily shows that use of psychotropic medications during pregnancy increase the probability of birth defects. Researchers at the University of Copenhagen have published an article that documents the serious side effects that can be associated with these types of medications. Between 1998 and 2007, psychotropic medications were associated with 429 adverse drug reactions in Danish children under the age of 17. Researchers from the University of Copenhagen's Faculty of Pharmaceutical Studies have published an article in the open access journal BMC Research Notes concluding that more than half of the 429 cases were serious and several involved birth defects, such as birth deformities and severe withdrawal syndromes. Professors Lise Aagaard and Ebbe Holme Hansen from the University of Copenhagen studied all 4,500 paediatric adverse drug reaction reports submitted during the study period to find those which were linked to psychotropic medications. The two researchers found that 42 percent of adverse reactions were reported for psychostimulants, such as Ritalin, which treats attention deficit disorder (ADD), followed by 31 percent for antidepressants, such as Prozac, and 24 percent for antipsychotics, such as Haldol. "A range of serious side effects such as birth deformities, low birth weight, premature birth, and development of neonatal withdrawal syndrome were reported in children under two years of age, most likely because of the mother's intake of psychotropic medication during pregnancy... Psychotropic medication should not be prescribed in ordinary circumstances, because this type of medication has a long half-life. If people take their medicine as prescribed it will be a constantly high dosage, and it could take weeks for one single tablet to exit the body's system. Three out of four pregnancies are planned, and therefore society must take responsibility for informing women about the serious risks of transferring side effects to their unborn child." --Associate Professor Lisa Aagaard. The researchers believe that these tendencies should serve as a warning to doctors and health care personnel. "We are constantly reminded about the dangers of alcohol use and smoking during pregnancy, but there is no information offered to women with regards to use of psychotropic medication. There is simply not enough knowledge available in this area. Greater control should be required when prescribing psychotropic medications to pregnant women."